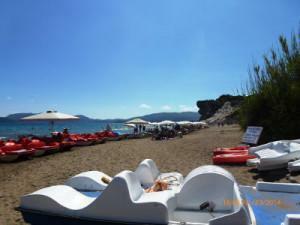 A typical day on a nesting beach in Zakynthos. Monitoring the conservation situation in Zakynthos for yet another year, we found that the National Marine Park of Zakynthos (ZNMP) remains at the stage of struggling to address the same challenges and problems as in previous years. Inadequate control and supervision of the Park’s marine area results in private and business boats becoming a constant nuisance to sea turtles, and also in the illegal entry and anchoring of fishing boats in Maritime Zones A and B, especially during the hours of darkness. Available space for nesting has been significantly reduced in the past few years, while noise and lights from nightclubs and hotels disturb nesting. ZNMP visitors are inadequately informed about the safety measures due to inefficient and sparse signage at key locations. On several occasions nesting disturbance was observed at night. Obviously, in the currently dreadful economic situation, the uncertainty surrounding the funding of the managing body of the NMPZ undermines the conservation of the most important loggerhead nesting site in the Mediterranean. The oversaturated and illegal landfill within the ZNMP was still operating last summer. Greece’s failure to take the right steps towards sealing the oversaturated and poorly functioning landfill site within the ZNMP, resulted, unsurprisingly, in condemnation from the European Court of Justice. Since 1998, the landfill has been operating without the necessary permits and without respecting the necessary environmental obligations. In 2011 the local authorities committed to restoring the site to prevent a landfill collapse. Instead, the landfill operation license was renewed until 2015 in complete disregard of European regulations that apply to “Natura 2000” sites (EU protected areas). 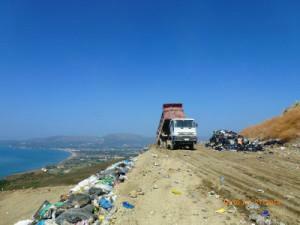 In March 2014, the Region of the Ionian Islands made a decision to shut down the landfill. This last-minute decision was not enough to prevent the EU Court from condemning Greece, as the country had been repeatedly warned that it must resolve this longstanding problem. The Greek authorities have been jeopardizing both the survival of an endangered species and sustainable development in Zakynthos. The negative publicity associated with the failure to meet basic international commitments has been undermining Greece`s environmental policy track record and the country’s reputation as a tourism destination. Together with the landfill’s permanent closure, immediate action must be taken to ensure the area’s restoration and prevent further environmental damage. In the meantime, an effective solution must be agreed for the sustainable management of the island’s increasing volume of waste.